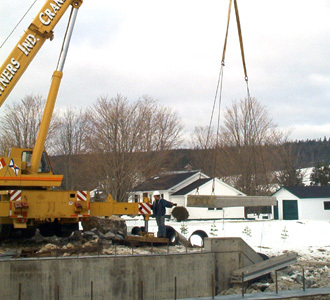 A common requirement of many bridges is that the superstructure be as shallow as possible to provide maximum clearance and minimum approach grades. Through prestressing, the designer can use the minimum possible depth to span ratios as low as 1:32. This can be achieved by using sections such as solid slabs, voided slabs, box girders or channel slabs. 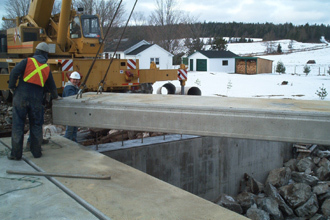 Voided slab bridges were adopted to reduce the self weight of the bridge. 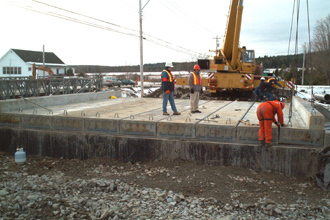 Voided Precast Prestressed slabs, with maximum depths of about 0.533m (21”) may be adopted for spans of about 6 to 15 m (20’-50’). The voids are usually circular with the depth of voids generally restricted to sixty per cent of the depth of the slab so that the slab continues to behave like a single plate. If this limit of void depth is exceeded, the slab may behave more like a cellular deck. The voids may either run for the full span length or alternatively these may be provided in the central span length only so that a solid section is available near the supports where shear governs the design.